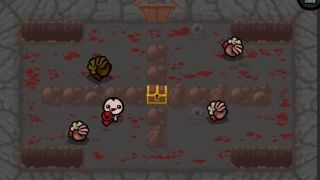 Given the frequency of updates lately, I'd hazzard a guess that The Binding of Isaac: Rebirth is approaching completion. Edmund McMillen posted this cooperative gameplay video earlier today, and it's looking good. Watch as Edmund and his sidekick Danielle rain tears of death upon their foes, and watch as Danielle faces off against a large sentient mound of feces named, um, Dingle. The video shows one of twenty challenge modes planned for the final game. Entitled 'Head Trauma', it forces players to use high speed but low damage tear projectiles. The above footage follows a similar gameplay video released earlier this month, as well as the news that Rebirth will allow users to capture and share game seeds , meaning especially good runs can be replayed over and over again.